Creating a home theater involves much more than just a large projector screen and a pumping sound system. Every theater needs a snacking center. 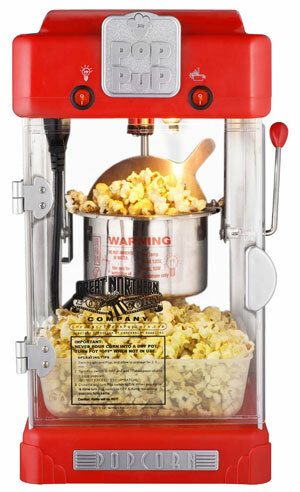 Rather than bringing snacks from the kitchen, give your space a bit of old-school flair with a kettle popcorn machine. While microwave popcorn is always an option, what’s better than a large bucket of fresh popcorn? These machines are a great addition to any movie theater, big or small. Not only are they functional but they add a great nuance to the room. The buttery smell of popcorn will waft through the air every movie night while everyone crowds around to watch the machine do its magic. It produces high-quality popcorn with that familiar taste we all know and love. 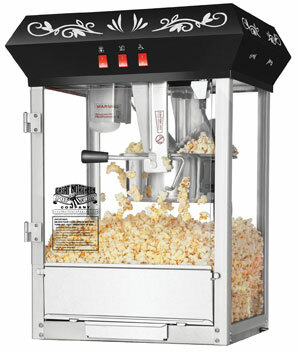 A number of popcorn machines are available on the market, each with their own unique style and features. While it can be a bit overwhelming at first to dig through the many specifications of these machines, it’s important to get informed so that you choose an option that’s right for your space. Here are 7 of the best theater-style popcorn machines for any home theater. This countertop machine has a cool look and great features. The kettle holds 8 ounces of kernels and uses 820 watts for a fast cook cycle. Three prominent switches on the top of the unit are used to control the machine. They turn on the light, heating elements, and stirring mechanism. Tempered glass is used on the side walls for safety while the main access door is made from tough polycarbonate. A tilting door on the front allows popcorn to cascade out for easy serving while a discrete drawer on the bottom catches unpopped kernels for easy cleanup. 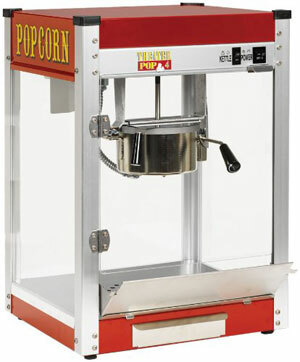 From the Great Northern Popcorn company is this versatile kettle popcorn machine. It’s available in either a single countertop design or with an accompanying pushcart for an authentic look. The top of the machine is clad in bright red metal while the tempered glass sides are framed out with beautiful powder-coated steel. The stainless steel kettle holds 8 ounces of kernels and requires 640 watts of power. The large door and tilting panel provide quick access to the delicious popcorn. This modern countertop model is perfect for serving many moviegoers in only a short period of time. The kettle holds a massive 12 ounces of kernels and uses 1350 watts of power to heat up. Most of the unit is made of stainless steel, including the kernel drawer and tilting panel. The rest is made of tough tempered glass. 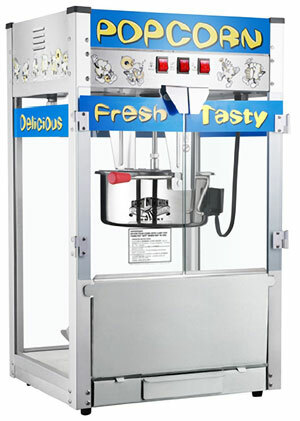 Instead of the obvious red color scheme, this machine has a unique and modern blue design with bright yellow text and graphics. With its bright red panels and signature yellow decals, this compact countertop machine will look great in any theater room. It has a small 4-ounce kettle and measures about 23 inches by 16 inches in size. Despite its small size, the machine has a high power requirement of 1200 watts. However, this is split between the heating element in the kettle and an element in the warming deck that keeps finished popcorn fresh. A cycle lasts between 3 and 5 minutes. The body is made of high-quality plastic and aluminum. 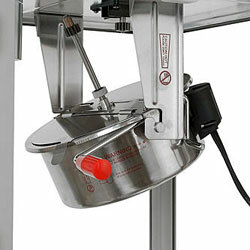 Compact and easy to use, this countertop machine from Hamilton will cook popcorn without taking up a ton of space. Instead of the traditional box design, this machine is made of two separate round parts that nest together. The bottom portion catches the popcorn and can act as a serving bowl. The kettle is relatively small, but it’s capable of popping over 5 liters of popcorn in a single cycle. The entire machine disassembles to save space. The popping chamber that keeps everything contained is made from high-quality plastic that’s dishwasher safe. If you need to save space, this tiny countertop machine is perfect. The kettle holds 2-1/2 ounces of kernels. 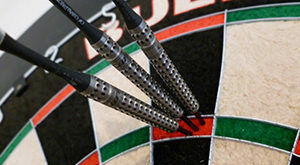 It’s made from stainless steel and has a built-in stirring mechanism. A warming light keeps popcorn warm until you’re ready to eat it. The popcorn sits in a large tray that easily removes to act as a serving bowl. It’s clad entirely in bright red plastic with silver accents. It’s easy to control the heating mechanisms with just two switches located on the top. 7. Paragon 1911 Popcorn Machine Antique 8 oz. 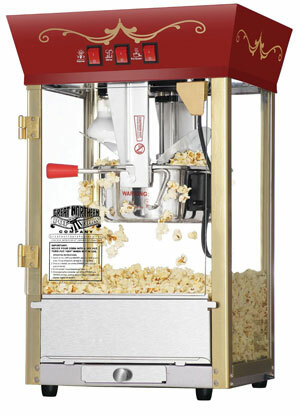 Simple and attractive, this popcorn machine from Paragon will keep families happy through many movies. It has a classic carnival design with deep red tones, a black tapered top, and prominent blue sign. It’s made from a combination of stainless steel and tempered glass for safety and easy maintenance. The aluminum kettle holds 8 ounces of kernels and uses 1420 watts to keep cycles short and quick. There’s also an effective warming deck to ensure that uneaten popcorn stays fresh and ready. 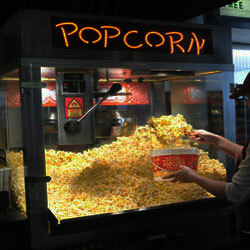 How Do Popcorn Machines Work? While popcorn is made many ways, kettle-style machines are the best method if you want to get that familiar taste and smell. Kettles preserve the flavor of the corn and allow you to create specific flavor profiles. Other popping methods tend to have a negative effect on the quality of the popcorn. Kettles cook the kernels with a heating element. The kettle portion is elevated and within arm’s reach. This is where you’ll add your kernels, oil, and any flavor you may want to add. The heating coil is located inside along with a mechanical stirring arm. This arm moves the unpopped kernels around the kettle, heating each individual piece evenly and covering it in the right amount of oil and flavor. As it heats up, the starches in the puff up and pop. The exact amount of heat is important. Too much heat will make the kernels burst instead of popping to a fluff while too little will prevent popping altogether. As the kernels pop, the loose lid will easily push upwards, allowing the popcorn to flow into the holding compartment for easy access. It’s relatively simple to use and takes only a few minutes to produce tons of delicious popcorns for movie night. One of the first things you need to consider is the overall design and build of the machine. It all comes down to space. If you’re tight on space or want something to look more built-in, go with a countertop model. These machines sit on a flat surface and take up much less space. Despite their size, smaller options work just the same way as larger models. You’re not sacrificing quality or flavor to save space. Larger stand-alone models, on the other hand, pack a big aesthetic punch. Essentially, these machines are carts that can be moved around. Decorations are usually extended onto the cart in the form of lights, bright colors, and prominent wheels. 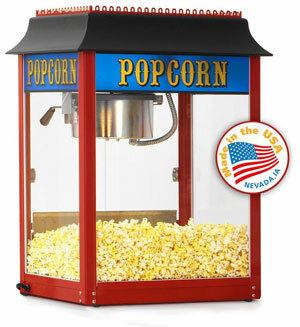 If you have the room for it, larger stand-alone popcorn machines look great in the corner of a theater room. Chances are, you won’t be moving the unit around, so it can simply sit at one spot as a functional piece of art. The size of the kettle is another important consideration. 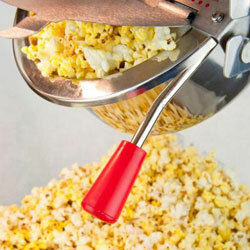 You’ll want to choose an option that produces enough popcorn without wasting kernels and causing a lengthy cleanup. Kettles are sized based on how much unpopped kernels it will hold. This is measured in ounces. Machines can have kettles as small as 1 ounce up to 32 ounces. A single ounce of unpopped kernels will produce about 1 liter of popcorn, so the kettle size will ultimately determine the size of the entire unit. Home theaters can benefit from a kettle that holds approximately 6 to 8 ounces. Larger kettles are often reserved for professional movie theaters while smaller options will only produce enough popcorn for small families. Wattage refers to how much power the machine needs. While many believe that a higher wattage rating is needed to make an efficient machine, that’s not necessarily true. Sure, it’ll make popcorn fast. However, it will result in more unpopped kernels and more wasted energy. Popcorn machines should be efficient. It needs to use power effectively to make the best popcorn possible. Just because a machine has a lower wattage doesn’t mean it’s inferior. In fact, it may mean that the machine is designed more strategically to ensure that energy isn’t wasted. For home theaters, it’s good to look at machines that have around 600 watts. You can choose an option with more or less based on how fast you want a cycle completed and how power-efficient you need the machine to be. If longevity is what you’re after, look for high-quality materials. Most machines are made from attractive steel and tempered glass. These materials are safe, easy to clean, and very resilient. It’s also a good idea to take a look at the parts inside. Metal components are a must-have. Cheaper plastic gears near the heating element will only degrade over time and can cause dangerous issues if the machine ever malfunctions. 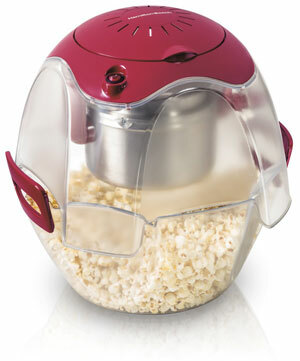 Regardless of the machine you choose, kettle popcorn poppers are a must-have accessory. They take your theater room to a whole new level and allow you to entertain friends and family. They look great and produce a staple snack you simply can’t watch movies without.